A truly feminine and alluring piece, the Stella Evening Dress fuses together romance and elegance. 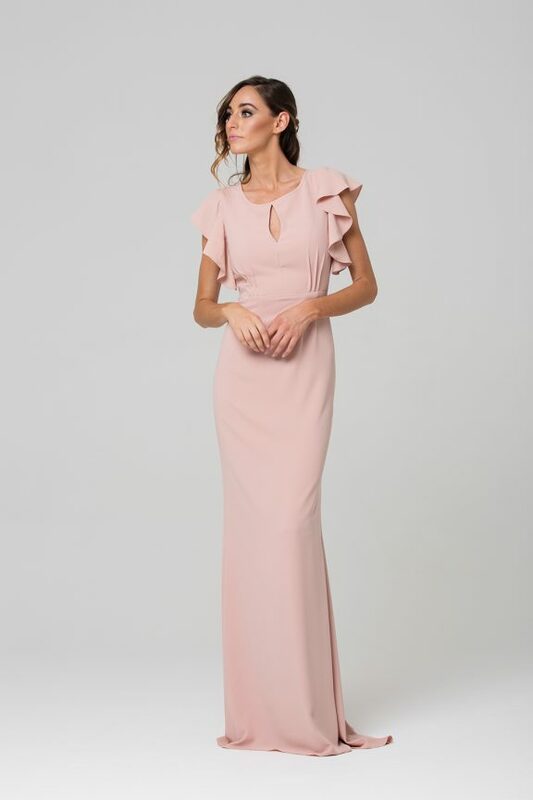 Fabricated from a soft crepe, the Stella style features a high scoop neckline, complimented with tasteful keyhole cutouts in the front and back, and ruffled sleeves. The Stella is fitted through the bodice, cinching in at the waistline, before falling to the floor in a gently pleated hem. Designed for the feminine bridal party, the Stella Bridesmaid is the epitome of elegance and style. The simplicity of this style also makes it a beautiful formal, or evening gown. The gowns cut and design is flattering to a variety of shapes and sizes (6-30). To identify your size see your nearest Tania Olsen Designs stockist and they will correctly measure you and assist with selecting your size.